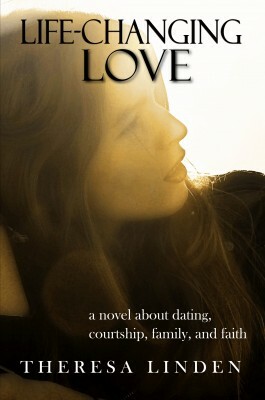 Theresa Linden’s new novel for teens, Life-Changing Love, releases today from Silver Fire Publishing. A standalone sequel to Roland West, Loner, this novel tells the story of Roland’s classmate Caitlyn, who at 15 is not allowed to date but who dearly wishes for a romantic relationship, competing for Roland’s attention with a girl who has no restrictions and seemingly few inhibitions. After reading (and thoroughly enjoying) both novels, I interviewed the author about the series and the idea of courtship as a dating alternative, which was central to Life-Changing Love. Roland West, Loner was written from a male character’s point of view; Life-Changing Love was told in the point of view of a female character. Did you find one easier to write than the other? I enjoy writing from the point of view of both male and female characters. Once I create them, giving them unique characteristics, strengths, and weaknesses, they sort of come alive in my mind. I can hear their thoughts in my head and understand how they feel about different situations. The only characters I struggle with are those that aren’t developed enough. That’s when I realize I need to spend more time “creating” a particular character. Will there be more books in the series? If so, who’s the main character in the next installment? I have several books planned but Battle for His Soul is completed and scheduled for release October 2, 2016. Jarret West is the main character. This story is different from the others because Jarret’s guardian angel is also a point-of-view character in the story. It brings a completely different perspective to the events in Jarret’s life. A central theme in the novel was the idea of courting as a healthy alternative to dating. How can families learn more about this? Through this book, I hope to encourage families to openly discuss this topic. Our children’s souls are at stake. Today’s culture too often promotes an unhealthy view of relationships that reduces everything to the physical. It has turned dating into something spiritually dangerous. Children are “dating” at younger and younger ages, making inappropriate emotional bonds. This opens the door to temptations for making physical bonds as well. But they are not necessarily thinking about marriage. Some argue that old-fashioned courtship puts too much pressure on the couple to marry. Courtship might not be the perfect solution, but families can take the ideas that work from both dating and courtship and create a plan for their children that will allow them to get to know themselves and others without undue pressure and by keeping things in the right order. While I think there are many definitions of the word “courtship,” I see it as something family-focused where two people get to know each other in a natural way. When a person is older and seriously thinking about marriage, getting to know the families provides valuable understanding about the person. A couple can further get to know each other in group settings like college groups. Courtship-type practices can allow people to get to know each other without risking their souls. Emotional Virtue by Sarah Swafford comes highly recommended as a guide for developing healthy and pure relationships. National Catholic Register has an article titled “A Parent’s Guide to Courtship” by Lori Hadacek Chaplin. Catholic News Agency has an article titled “The difference between courtship and dating” by Anthony Buono. What can families do to help their teens be more receptive to the idea of courting? Regular family prayer: be the leader and example in showing that God comes first. Enlist the help of the patron saints for purity and chastity like St. Aloysius Gonzaga and St. Maria Goretti. Regular family discussions: the teenage years come with a whole new set of hopes, ideas, and challenges. Be there to guide them and let them know you care. Talk about virtue and the spiritual side of life. Our primary goal is to get ourselves and our loved ones to heaven. It’s easy to lose focus so practice making the discussion of virtue a part of daily life. Create a welcome and open environment in the home so your teens feel comfortable inviting their friends over. Point out good examples and bad examples as you notice them in the news or in TV shows, books, and movies. Discuss the consequences that come from these choices. Remember that helping our children to protect their virtue and develop healthy, age-appropriate relationships is very important. We want our children to have the freedom to get to know others, while having fun and showing respect, cooperating with God’s plan for their life. It will help them to have successful marriages and families in the future! The Fine Print: I received an advance copy of the book, and no other compensation, for the purpose of this review. Opinions expressed are mine alone. Your purchase of this book through my Amazon link supports Franciscanmom.com. Thank you!